The Global Goals World Cup was created by a small danish organisation with a big idea: To create sports events that inspire amateur athletes to become champions of the UN's 17 Sustainable Development Goals and drive progress and change in their communities. In 2015 Rikke Ronholt thought that the way to put gender equality and the Global Goals on the agenda in Denmark was through a women's football tournament. It just so happened, that Majken Gilmartin had been doing that for years! The two women met, and the idea of the Global Goals Ball and World Cup was born. The first Global Goals World Cup tournament was held in Copenhagen during the Women Deliver Conference. Artist Olafur Eliasson donated little suns as medals. Save the Children, the city of Copenhagen, the Danish FA and Danfoss were among the partners. Team Bikespice Your Life won the grand prize of participating in the Global Launch in NYC. 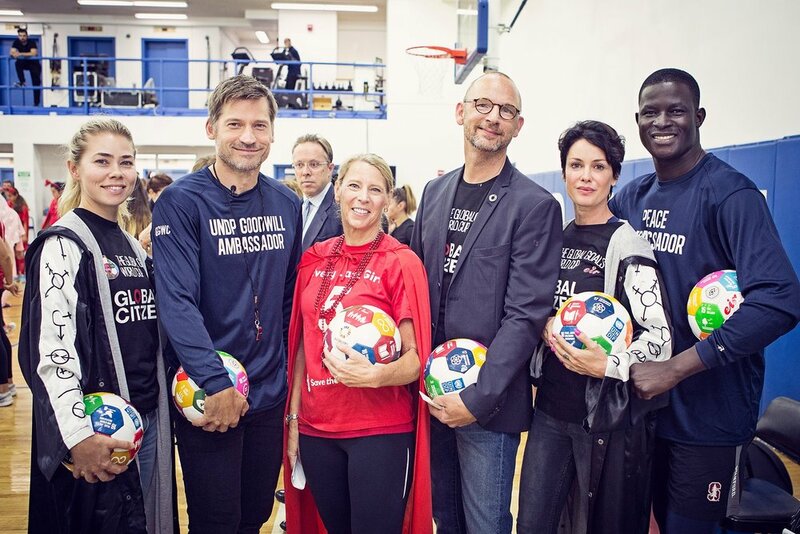 The Global launch of GGWCup was held alongside the Social Good Summit @92Y With support from the Danish Ministry of Foreign Affairs, UNDP and Goodwings. We got our first ambassadors: Lene Nystrøm (Aqua), Birgitte Hjort-Sørensen (Borgen) Nikolaj Coster-Waldau and Victor Ochen. Moving The Goalposts took the victory in Nairobi. 2500 spectators cheered them on. They won a trip to compete in the tournament in New York later that year. Eir partnered with the Royal Danish Embassy, Save the Children and GAIN for this event. With support from Safaricom, Flora Holland & Little Sun. -The amazing Ihan Haydar from the danish band L.I.G.A composed our Global Goals anthem! The Second Global Goals World Cup in NYC was played at the Brooklyn Expo Center with 24 teams! Opening speech by HRH Crown Princess Mary of Denmark, New Sonsors GANNI, Shamballa, Joe and the Juice, Cadilac & Muuto. Partnership with Global Citizen, UN Women and Women Deliver. Annie Lennox nominates a player for the SDG 5 Dream Team. Moving the Goalposts bring the trophy home to Kenya. The SDG ball is displayed at the Olympic Musem in Lausanne. www.ggimpactgames.com is launched: A full program of games and drills to teach children and playful minds about the Global Goals. Amazing Becca Todd (2nd from right) heads the effort to devlop new games and trains kids at Dana Cup. Marie Hansen builds the concept and the website. Big Mango FC won the first Asian Global Goals World Cup in Bankok, hosted by NIST International School and Chelsea FC Foundation in partnership with UNDP. Pandora was main sponsor and the Royal Danish Embassy held a dinner for the partners. Everyone agreed that this was the beginning of a beautiful friendship, and the next GGWCup Bangkok is scheduled for Februrary 2019. Sustainable Mindz moved mountains and put on a spectacular Global Goals World Cup for the UAE. Hostet at the Sustainable City in Dubai. 23 passionate women's teams played for the world they want. The first Global Goals League was launched in partnership with the Royal Danish Embassy, Boca Juniors, the city of Buenos Aires and Arla Food Ingredients. Leo Messi shares the video about the event with is 89 mil. followers! The girls playing in the league are invited to present their experiences at the Youth Olympics later in the year. Each team plays and take action for their chosen goal every week. The SDG Ball gets its own exhibition at the Nobel Peace Centre. 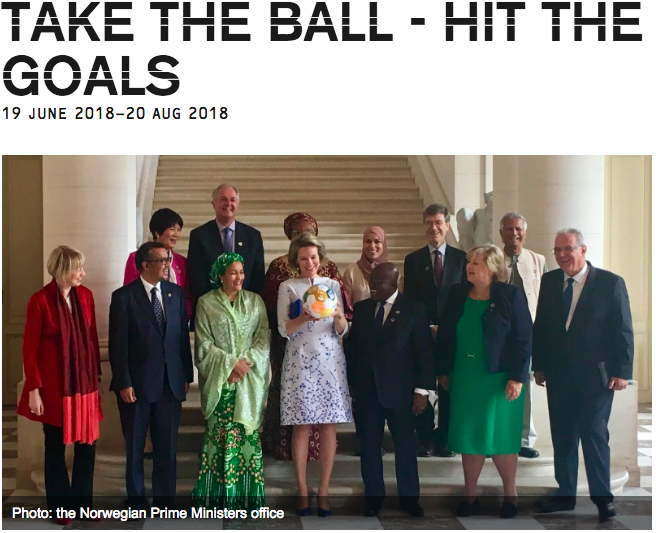 Norwegian Prime Minister and SDG Ambassador Erna Solberg launches the #TakeTheBall campaign and brings the SDG ball to her official meetings.